Roll Red Roll is a film designed to create greater awareness of sexual violence and the culture that enables it. It is meant to be a call for all of us to challenge those parts of our culture and communities. This companion discussion guide includes information on facilitating discussions; prompts to discuss What is Sexual Assault?, the Myths and Realities of Sexual Assault, and the Responsibility and Role of Men Challenging Sexual Assault among others; and additional resources. This guide is an invitation to dialogue. 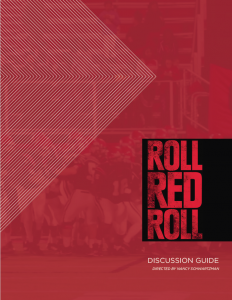 It is based on a belief in the power of human connection, designed for people who want to use Roll Red Roll to engage family, friends, classmates, teammates, colleagues, and communities.